Directed by Gavin Hood, the South African filmmaker behind the excellent Oscar-winning film Tsotsi, this movie has a surprisingly uneven tone, but makes no bones about the fact that it’s going for the excited child in you. So if you enjoy watching trucks being blown up and grown men stabbing each other with their claws, this film can be pretty good fun.I’m going with a generous three out of five for X-Men Origins: Wolverine; you can be sure more X-Men spin-offs are on their way. Director Gavin Hood goes back to the nineteenth century to trace the origins of Wolverine’s super powers along with with his weltanshaung (read worldly despair).End result? A visually overpowering, high testosterone prequel to Marvel Comic’s popular super hero.Go for Jackman’s restraint and chutzpah and for the stunning action sequences which include a dizzy interlude where Wolverine jumps from a truck onto a helicopter, only to slice off its rotor blades with his claws and then walk off while it explodes. Kinda cool and king-size. All you miss is some substance and meaning behind the mayhem. X-Men has its share of high-octane action as one would expect from it but lack of originality and excess of cliché leads to disappointment. The story, treatment, characters, injection of pathos in the script… everything seems generic, including the hyper sensitization of the film’s main character Wolverine.This ones X-tra sensitive instalment of the X-Men series… you can afford to X-cuse yourself from watching it. The first movie (and the following parts) is a lesson in politics and our fear of the unknown. 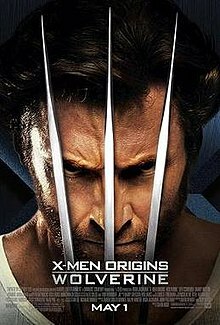 X-Men Origins however reduces this large complex web of issues into a simplistic story of a man out to get the killers of his wife.Having watched and loved the first three movies, Wolverine comes across as a bit of a letdown. Half way into the films, when the best action sequence is over – the one where he brings down the chopper – you actually begin to lose interest in Wolverine’s story.Watch this movie only if you’re a Hugh Jackman fan. X-Men fans are likely to get disappointed.